The 'Marketing Matters' blog focuses on marketing issues related to the Employability sector. Members are encouraged to share their ideas and successes by using the COMMENT box to expand upon discussions posted here and to suggest new ideas. As a Membership organisation, it is essential that IEP involves and engages the entirety of its Membership in order to provide full representation and to inform its work in order to provide maximum benefit and value to the whole Membership. As such, we operate a range of engagement opportunities to maximise participation, including IEP Regional Groups, Corporate Affiliate Partner Groups, IEP Events and the sharing of information via social media channels. One such social media channel is the IEP’s dedicated LinkedIn Group. Effectively a networking group for Members of the IEP, our LinkedIn Group helps us promote IEP activities and initiatives and keep Members up to date about important events and issues that affect them and the profession as a whole. It’s a great place to see the latest content, take part in surveys, make business contacts and establish yourself as industry experts too. First, if you haven’t done so already, join LinkedIn at www.linkedin.con and register your details. Click on the ‘Ask to Join’ button on the right side of the screen. Come and join other Members and take part in the conversation with your professional Institute, it’s your IEP so get involved! The IEP and Empowering-Communities sponsored the 'Team of the Year Award' at this year's ERSA Employability Awards and are proud to announce that the award went to Radian's Employment, Support and Training team (EST. The award recognises how the team demonstrate “outstanding commitment in meeting and exceeding the delivery aims of an employment provider”. Although Radian is primarily a housing provider and housebuilder, the EST team have considerable experience in delivering employment and training initiatives for their residents and local communities. Being able to support 550 residents into employment. Getting over 1,675 residents into training and support opportunities. Offering 40 work programme placements, open to long term unemployed people aged 18-24. 34 young people achieved employment at the end of the programme. Offering over 150 training courses, including numeracy/literacy, ESOL, CSCS, SIA training and employability courses for those furthest away from being ready for work. Offering work experience opportunities within Radian’s offices. Mentoring opportunities for Radian residents. Over 2,800 hours of volunteer support offered. One of Radian’s most recent projects has involved working with partners in the creation of new employment and skills opportunities on its development at Quebec Park, Bordon. Eleven local residents have been trained in basic construction skills and have gained their Construction Skills Certification Scheme (CSCS) cards. Seven of these residents have now secured employment with the industry. A significant element of their employment and skills initiative at Quebec Park is implementing construction curriculum support activities. So far, we have hosted two visits from local schools which enabled students undertaking construction exams to experience the workings of a construction site first hand. In June, students from Mill Chase Academy joined Radian and Drew Smith at Quebec Park for a construction competition. Pupils were challenged to make a planter from recycled materials provided by Radian and Drew Smith, and their finished products will be placed at the Quebec Park development outside of the café area. The winner was rewarded with a mountain bike and a start up toolkit to support them in the beginning of their construction career. The team are working towards some interesting projects over the coming months, including working with people with multiple barriers to employment in the areas of East Hampshire, the New Forest and Winchester. This is being made possible by funding that has been secured via the Big Lottery Fund project “Building Better Opportunities”. As well as this, the team are developing plans to compliment their self employment training programme, providing a multi occupancy building for business start ups that will create a “one stop shop” where those on the programme can sell their goods and services, as well as receive the training and support they require. 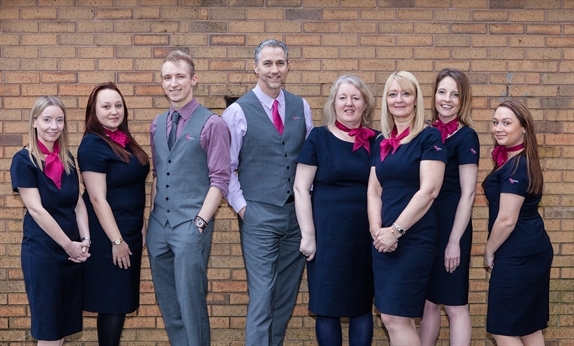 If you would like to find out more about the EST team, please call 0800 422 0570 or email estsupport@radian.co.uk. Employability Professional (EP), the profession’s only publication dedicated to frontline employability professionals, has reached its 50th edition! EP, edited weekly by the IEP’s Heather Ette, has grown to reach over 5000 employability professionals across the employment support sector, all over the UK. EP is developed through the IEP’s partnership networks and is designed to keep all staff up to date with what is happening in the sector, provide expert information and is an excellent resource for sharing best practice and improving personal and professional knowledge with a particular focus on those that deliver services on the ‘frontline’. "After being featured in an early edition of EP, I have been blown away with some of the responses to my 'Shop Window Jobs' concept from a wide range of people across, not only Remploy, but also others in the sector who were inspired to start their own local social media group focusing on local jobs. Personally, I find EP a must read each week. It keeps me up to speed with events taking place and new initiatives happening across the UK and I am always interested to read other peoples 'Employability People' Q&A's to see if I can pick up some fresh new ideas to use in supporting our own team across North Wales!" "I’ve found EP to be really useful as it gives an insight into the industry from other companys and individuals in the sector. I’ve found inspiration in some of the articles within the knowledge bank. It has helped us to keep up to date with current events and has allowed members of staff to take part in external activities that have increased their skills and enhanced our customers journey. Keep it coming! The IEP is Coming to a Town Near You! With the launch of the IEP Induction pack, we are extending our ability to support the professionalisation of frontline staff. The IEP now aims to provide this valuable staff training in the form of a one day training session, across the country, at a centre near you. There has been a long term agreement that training is necessary across the sector. The development of the ERS Level 3 Qualification was a strong start. But many people want a more modular flexible approach that can provide a strong basic introduction to key issues. IEP’s induction Pack will provide the basic framework of necessary skills for the sector and has been designed specifically to be run as in-house or supply chain training programmes. For the programme to be delivered effectively, it is vital that training managers are able to provide professional training across the board. This is where the IEP steps in to provide support. Each training session on the Road Show will be followed by a networking event, where participants and other IEP members can share, engage with and discuss with colleagues. The programme is a one day course, covering the full content in the Induction pack. The course will prepare centre managers and training staff to deliver the IEP induction pack to their staff and colleagues, in addition to developing their skills as trainers. It promises to be an inspiring and motivating day for all participants, allowing them to kick-start and develop their own training programmes, incorporating content from the IEP and their respective organisations. £152 – 1 Day Programme (Non-Members): Includes free annual IEP Membership. All participants receive 20 CPD Points towards their IEP Annual CPD Certificate. Since the launch of Focus on the Frontline at the IEP’s Annual General Meeting last year, to say the IEP has transformed would be an understatement. With a major investment into our IT resources, the IEP committed itself to creating a real environment of best practice and sharing; a process I am immensely proud to have been a part of. Employability Professional and the Knowledge Bank enabled us to reach thousands of people working across the sector with relevant information; with the aim to become the Wikipedia of Employability. With our new IEP Forums, and Topics headed by our Fellows, we’re aiming to allow our members to have a real voice in their industry; to network, debate and communicate with their colleagues from the comfort of their own homes. In a sense, we seek to become the Facebook of Employability. Our Jobs Board, kindly sponsored by Parkhouse Bell, and future partnerships seek to support staff during turbulent times. We aim to be that safety net and support our dedicated members when they may need it most; the Jobmatch of Employability. Yet at our very core remains our dedication to supporting our Members’ continued professional development, both in and outside organisations. Our Mentoring Programme, online Induction Pack, certifications and Endorsed by IEP courses all aiding us to develop into the Khan Academy of Employability. We understand that recent developments mean a great deal of uncertainty in the employability landscape, but as challenging as the near future will be, it also presents a great deal of opportunity. In particular there is an opportunity to become a more open sector, where partnerships between individuals and organisations are more commonplace, and where improved communication and professionalisation make the sector the best it can be in the face of adversity. Alongside our partners at ERSA, who represent a range of organisations in the sector, we’ll continue to fight your corner; supporting you through the challenges ahead, building an employability community and most importantly, helping you to become the best employability professional you can. Should you wish to get in touch with us at the IEP, or have any questions with regards to our projects, please don’t hesitate to get in touch with me at thisara@iemployability.org. If you ask that simple question to staff in most companies they’ll probably say “The Marketing Team”. More enlightened managers will of course tell you that EVERYONE in the organisation is responsible for marketing. Logical as that may sound, it never ceases to amaze me just how many companies use phrases like “customer-facing staff”, thereby creating the impression that those who never meet customers have no marketing responsibility at all. In an age where social media is king, every member of staff can have a profound effect on the way an organisation is seen by its customers and stakeholders. This is especially true in the employability sector where competition is often not understood and multi-site working often means poor communications. Another common mistake is not involving marketing people in ALL areas of the business. Product development in the employability sector is a classic example. I’ve seen lots of materials that meet the requirements of DWP or the learning outcomes of an awarding body but have no appeal to the customer whatsoever. So whose job is the website or intranet? Give it to the IT team and it may work really well but look awful. Give it to the marketing team and it will look great but may not perform technically. Here comes the next big mistake – The Project Team is born. In many cases the result is a camel – a horse designed by a committee. There are a lot of occasions when staff are told to NOT engage in communications. I’ve witnessed situations where an event at a branch office may attract a lot of negative media attention. A stern memo from on high appeared with strict instructions that on no account should anyone speak to the press but should instead refer all calls to the marketing department. My final pet hate, about something that is all too common in our sector, is the refusal to accept that anyone actually sells anything! Nothing happens anywhere in this world until a sale is made but apparently we don’t have any sales people! Sure we have ‘Employer Engagement Officers’ and 'Employment Advisors'. We teach them all the rules of game but in my experience of employability organisations, sales skills come way down the list. And yes, you may need to SELL the idea of a new job! Make marketing a part of EVERY job description – just a few lines about how staff should portray their organisation. Include more about this in induction training and use social media to engage staff in the marketing philosophy of the organisation. You can’t make all the staff marketing gurus but you can get across the importance of issues like protecting the brand during other training sessions. Use your Intranet and e-Learning systems to ensure that everyone has a basic understanding. Does everyone know the rules about using the company logo and where to get it? (Be honest, have you ever seen logos elongated or in the wrong colour on your materials) Use templates with macros for stock paragraphs. Do you agree that there is more that we can do to improve marketing in the sector? Let’s have your ideas here and let’s also hear from the chalkface and not just the marketing pros. Paul Wolstencroft is a Fellow of the Institute of Marketing and a Chartered Marketer.